Social action is a great way to build relationships between different communities. Most Mitzvah Day projects work well as an interfaith project. For project- specific information, please refer to the relevant How-To guide on the Mitzvah Day website. 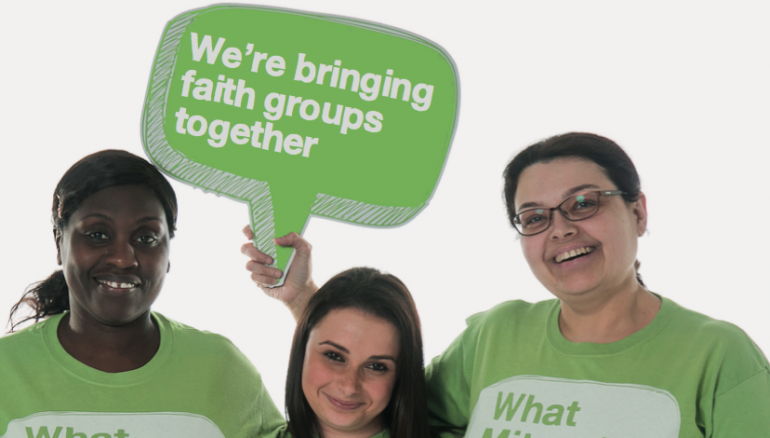 you may already have a relationship with a local faith community, and reaching out to them about Mitzvah Day could be a useful way to build this connection further. if not, the Mitzvah Day interfaith Manager can help you to nd a community in your local area, and facilitate your first meeting together. it’s best to meet face-to-face with representatives from the other communities to discuss Mitzvah Day project. this meeting might be at the place of worship for one of the communities, and could also involve a tour around the building. While discussing project possibilities, focus on the issues or causes close to the communities’ hearts. if there is a project that one of the communities is already involved in, this might be an easy idea to develop. remember to bear in mind particular religious and cultural sensitivities, such as dietary requirements and modesty codes, which could arise as part of the discussions. Register your community or organisation here, adding details about the other faith partner(s) when you sign up. the Mitzvah Day interfaith Manager is available to help you build a successful and long-lasting partnership, so please get in touch. Be aware of different dietary requirements. if in doubt, just ask them! Some people may not be comfortable interacting closely or having physical contact with members of a different gender. if you’re unsure, err on the side of caution. Not everyone will be comfortable having their photograph taken. always check before taking a photo. Be sensitive to prayer times. for example, some Christians may have less availability on Sundays, and some Muslims may have prior requirements during their day which need to be factored in. Different religious traditions have different theological beliefs, such as on iconography or the divine. if you feel that this could be an impediment to the development of individual relationships, try to and ways to mediate this, such as using a neutral venue or focusing primarily on the joint social action. Assume goodwill! everyone is there to help others. if something makes you uncomfortable, presume that there was no intention to offend, and the resulting discussion will be much more good-natured.